Today's short is a performance of Elegy for the Arctic, composed and played by Ludovico Einaudi at the Wahlenbergbreen glacier, Svalbard, Norway. The 2016 event was assisted by Greenpeace. ✦ Greg Lindquist makes beautiful abstractions of pollutants, such as coal ash from North Carolina's Dan River. Work by Lindquist and Damian Stamer can be seen through September 11 in "Altered Land" at North Carolina Museum of Art, Raleigh. Greg Lindquist on His Work in Altered Land from The North Carolina Museum of Art on Vimeo. ✦ The Artistic Noise program provides for visual arts practice and development of entrepreneurial skills among youths who are incarcerated, on probation, or otherwise in the judicial system. The New York-based program, currently celebrating its 15th anniversary, sponsors an Artist in Residence. Read Priscilla Frank's article in The Huffington Post, "How Incarcerated Youth Are Making Their Voices Heard Through Art". ✦ Recycle and reuse are two of Jennifer Collier's favorite words. The award-winning artist transforms books, maps, envelopes, wallpaper, scrap paper, and vintage material into two- and three-dimensional objects, from cameras to home and garden goods to garments and shoes. ✦ Ohio's Columbus Museum of Art offers "Think Like an Artist Thursdays", 5:00 p.m. - 9:00 p.m. The next opportunities are August 25 and September 29. Past events have included yoga and meditation in the galleries, music activities, and special projects by local artists. The museum also hosts an Art Book Club and the ongoing program "Wednesdays@2". ✦ Visiting San Francisco? See "Claudy Jongstra: Aarde", on view through April 2, 2017, at SF MoMA, featuring Jongstra's monumental, site-specific mural installation comprising hand-dyed wool. Jongstra trained as a fashion designer and subsequently took up the art of felt making; she raises sheep and handpicks the wool she uses in her art. The Dutch word "aarde" means "earth". View an image of the installed mural. Read "Why Claudy Jongstra Has Her Own Herd of Sheep", an interview. ✦ Laurie Anderson's advice to young artists? "Be loose!" My thanks to Louisiana Channel for the link. ✭ Fifty-four works by 50 artists, including 31 exhibiting for the first time at International Print Center New York, are on view through September 24 in "Innervisions: New Prints 2016/Summer". Selected from more than 2,000 submissions by 800 artists, the New York City exhibition, curated by artist Dan Walsh, represents 16 states and 10 countries. Included are lithographs, monotypes, intaglios, screenprints, engravings, relief etchings, solarplates, woodcuts, aquatints, collagraphs, and other print forms. A list of the artists is found at the exhibition link. Dan Walsh will give a talk at IPCNY & Pace Prints on September 21 from 6:00 p.m. - 8:00 p.m.
✭ The Tweed Museum of Art at the University of Minnesota-Duluth is presenting through September 4 a photo essay, "Vance Gellert: Iron Country", that shows the effects of mining technologies on the environment, society, and the economy. Gellert is a native of St. Paul and a pharmacologist who has been photographing people and landscapes since the 1970s. View a selection of exhibition images (pdf). ✭ For its third biennial exhibition on bird-related art, Ohio's Toledo Museum of Art has mounted "Keep Looking: Fred Tomaselli's Birds", featuring five paintings/collages, a tapestry, and a selection from Tomaselli's Field Guide series. Continuing through August 7, the show explores birds, visual perception, and transcendence in the artist's work. See the museum's online exhibition "In Fine Feather: Birds, Art & Science". ✭ The exhibition "Liz Miller: Miasmatic Filigree", featuring Miller's mixed media installations, is on view through November 20 at South Dakota Art Museum, Brookings. Exhibition images, biographical information, and Miller's Artist Statement are included in a two-page brochure (pdf). Also see Liz Miller at David B Smith Gallery, where you'll find images from Miller's site-specific installation Recalcitrant Mimesis. ✭ In "Measure, Gesture, Form", Oregon's Portland Art Museum highlights a selection of modern and contemporary drawings from a bequest of more than 200 drawings, paintings, sculptures, and prints. The exhibition, continuing through August 7, include American and European drawings, dating from 1958 to 2008, by such renowned artists as Sean Scully, Joe Goode, Brice Marden, Bruce Conner, Christopher Wool, David Smith, Anthony Caro, Lucien Freud. I'm pleased to introduce to my readers here and at the online arts magazine Escape Into Life new work by award-winning artist Rachel Rovay. Since 1979, Rachel has shown her work in more than a dozen solo exhibitions and more than 60 group exhibitions, both in Australia and abroad. She is represented in private collections in Australia, New Zealand, the United States, the United Kingdom, Israel, and Romania; and in public collections including the State Library of Victoria, the Australia Conservation Foundation, and the Jewish Museum of Australia. 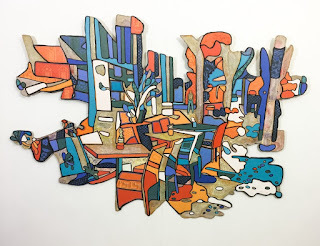 Today's Artist Watch column at Escape Into Life features eight of Rachel's boldly colored "urbanscapes", her Artist Statement, a brief biography, and links to her Website and a selection of social media sites. I write on walls, I write messages that talk to the people. In Manshiyat Naser, a ward of Cairo, Egypt, where city garbage collectors (slangily and derogatorily called "zabaleen") live, French-Tunisian artist eL Seed undertook a self-funded conceptual art project to bring attention to the area, which, he discovered, is overwhelmingly Coptic Christian, and a recycler of some 80 percent of the trash generated in the district. As eL Seed notes in his essay at TED, once he saw the area, he realized how wrong his assumptions and perceptions had been about the neighborhood and its residents. With the blessing of the local priest, eL Seed conceived of "an anamorphic mural", that is, a work that is recognizable only from a specific vantage point. "I chose this technique," eL Seed recounts in his essay, "because I wanted to raise the topic of how people tend to judge others without knowing them at all. . . I wanted to create a symbol that forced people to look from the correct angle . . . to see clearly." A TED Fellow, eL Seed describes himself as a calligraffiti artist; that is, he combines Arabic calligraphy with graffiti. He has painted the world over. For additional images of eL Seed's Cairo project, see Tech Insider's feature of March 30, 2016. Other videos and images of eL Seed's calligraffiti are available at his Website. Also see his sculptural work. 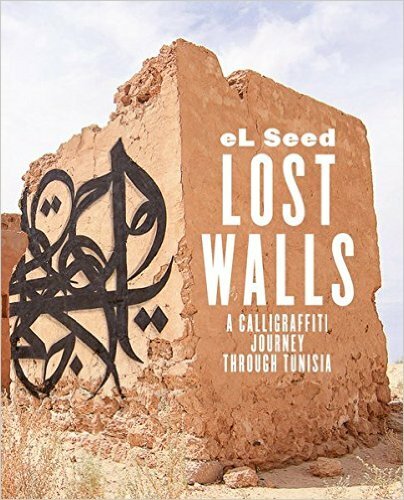 eL Seed has written about his project to paint 24 walls in Tunisia in four weeks in Lost Walls: A Calligraffiti Journey Through Tunisia (From Here to Fame, 2014). His limited edition of the book sold out. Odeith of Lisbon, Portugal (view a Twisted Sifter feature on Odeith), and the team Truly Design (see "Great Anamorphic Murals" at Where Cool Things Happen) also paint anamorphic murals. There are many such murals to be found around the globe. 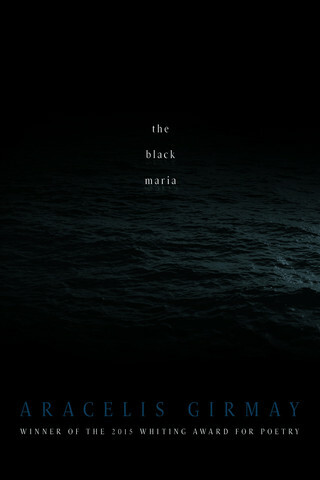 Earlier this year, Aracelis Girmay published a deservedly acclaimed third poetry collection, The Black Maria (BOA Editions, 2016), that ranges through the depths of violence and pain, racism and injustice, death and loss and grief, and manages still to come out on the side of redemption. It is both elegiac and celebratory, historical and resonant of the moment we live in. Below is the trailer for the book. It speaks to the remarkable lyrical poetry in the 120-page collection, providing just one reason why the book received a Whiting Award for poetry. Girmay's other collections are Kingdom Animalia (BOA Editions, 2011) and Teeth (Curbstone Press*, 2007). The former was the recipient of BOA's Isabella Gardner Award and also named a finalist for a National Book Critics Circle Award. In addition to poetry, Aracelis Girmay writes fiction and essays. She both wrote and illustrated changing, changing: story and collages (George Braziller, 2005). A Cave Canem fellow, Girmay teaches at Hampshire College and Drew University. * Curbstone Press was acquired in 2010 by Northwestern University Press. we increase our capacities for compassion and invention. 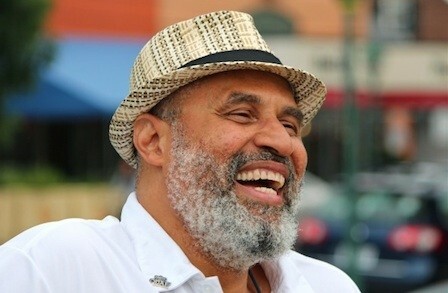 Tim Seibles is Virginia's eighteenth Poet Laureate. His appointment was announced July 15, 2016. Seibles, who continues in the post through June 30, 2018, succeeds Ron Smith (2014-2016). Information about the legislatively created post is included in my Monday Muse profile of the late Claudia Emerson (2008-2010). Others who have served include Sofia M. Starnes (2012-2014) and Kelly Cherry (2010-2012). Self-described "ambassador of the arts", Philadelphia-born Tim Seibles is the author, most recently, of Body Moves (Corona Press, 1988; Carnegie Mellon Classic Contemporaries Series Poetry, 2013) and Fast Animal (Etruscan Press, 2012). The latter was a finalist for the 2012 National Book Award. The poet's other books include Buffalo Head Solos (Cleveland State University Poetry Center, 2004), a collection of persona poems; Hammerlock (CSU Poetry Center, 1999), and Hurdy-Gurdy (CSU Poetry Center, 1992). In addition, Seibles has published the chapbooks Ten Miles an Hour (Mille Grazie Press, 1998) and Kerosene (Ampersand Press, 1995). Among the many subjects that Seibles addresses in his poetry are sexual discovery, love, spirituality, race, poverty, religion, innocence, loneliness, identity, self-awareness, childhood and adulthood, life's fragility, remembrance, power and vulnerability, the African past and present, sports, and animals. He salts his poems with numerous cultural references and allusions, from films to cartoon characters, to Greek and Roman myths, to politics; black vernacular or other slang, and what he describes as "highfalutin words"; and quotations from international poetry and other languages, especially African languages. Seibles's imagery is inventive, sometimes oddly juxtaposed, never stale, often sensual and consciously sexual. ("I try to embrace many facets of the sexual world in my poems," he told a Bucknell interviewer, adding, "This is one way for a poet to oppose those forces in the culture who fear this beautiful and mysterious aspect of our humanity.") His diction can be playful, sparkling with touches of humor, as well as lyrical. Rhyme also marks his work. Though he writes primarily free verse, Seibles also uses traditional forms, such as odes, ballads, and villanelles. He gives attention to line and stanza breaks and where he allows pauses (notice his spacing of words). He excels at poems in long form, which tend to run from 150 lines to 400 lines(!). 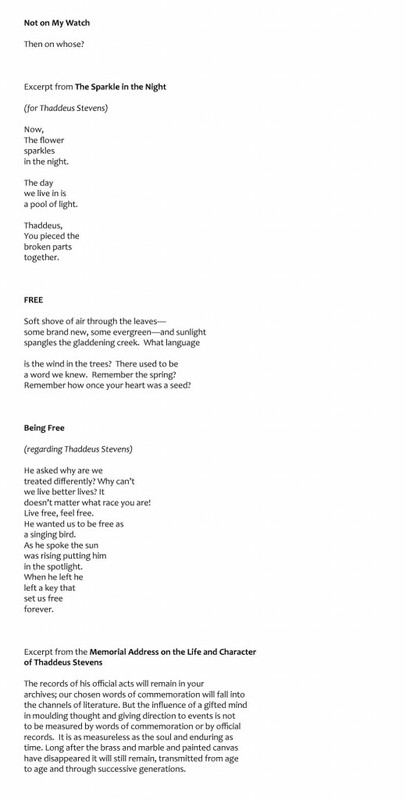 Following are excerpts from several of Seibles's poem, which I think are especially notable for their lyricism, beautiful, even startling images, and music. Notice, too, in the third excerpt (from an extraordinary poem) Seibles's use of metaphor, similes, and effective repetition. The energy in his poems is propulsive. ~ from "One Turn Around the Sun"
* Hear Seibles read "First Kiss". Poems by Seibles have appeared in such literary periodicals as The Artful Dodge, Beloit Poetry Journal, Black American Literary Forum, Black Renaissance Noire, Callaloo, Cortland Review, Dark Eros, Electronic Poetry Review, Huizache, Indiana Review, The Kenyon Review, Massachusetts Review, New England Review, New Letters, Ploughshares, Rattle, and Red Brick Review. Seibles's poem "Sotto Voce: Othello, Unplugged" is anthologized in The Best American Poetry 2013 (Scribner, 2013); his poem "Allison Wolff" is in The Best American Poetry 2010 (Scribner, 2010). Some other anthologies that include Seibles's work are Of Poetry and Protest: From Emmett Till to Trayvon Martin (Kindle Edition; W.W. Norton, June 2016), The 100 Best African American Poems (Sourcebooks MediaFusion, 2010), Black Nature: Four Centuries of African American Nature Poetry (University of Georgia Press, 2009), Seriously Funny, and So Much Things to Say (Akashic Books, 2010). The anthologies Autumn House Contemporary American Poetry, Outsiders: Poems About Rebels, Exiles and Renegades (Milkweed Editions, 1999), Verse and Universe: Poems About Science and Mathematics (Milkweed Editions, 1998), E. Ethelbert Miller's In Search of Color Everywhere, New American Poets of the '90s (Godine, 1991), and A Way Out of No Way: Writing about Growing Up Black in America (EdgeBooks, 1996) also feature Seibles's work. Seibles has been the recipient of a number of awards, among them the 2013 PEN Oakland Literary Award (Poetry), for Fast Animal; the 2014 Theodore Roethke Memorial Poetry Prize; fellowships (Provincetown Fine Arts Work Center, 1991; and National Endowment for the Arts, 1990), the 2009-2010 post as Poet-in-Residence at Bucknell University; and the Open Voice Award (National Writers Voice Project). He also is the holder of an honorary Doctorate of Humane Letters from Misericordia University. In addition, artist Scott Stanton (a.k.a. Panhandle Slim) painted Seibles's portrait, one of eight decorating the walls of Payne Hall at Savannah State University. A professor of English at Old Dominion University, Norfolk, Virginia, where he teaches in both the English Department and MFA writing program, Seibles also leads or has led workshops for Cave Canem and the Zora Neale Hurston-Richared Wright Foundation; is a teaching board member of The Muse Writers Center, in Norfolk, Virginia; and teaches in the low-residency Stonecoast MFA creative writing program at the University of Southern Maine. In addition, he visits colleges and universities, as well as middle and high schools, to read and demonstrate his love of poetry, conduct workshops, or lecture. He attends many poetry festivals in the United States and abroad. Seibles reads 20 of his poems at "Tim Seibles Poetry Reading" on YouTube. Each pause is a wish for things unsaid. Quoted from "Comfort Woman" in Sjohnna McCray's Rapture (Graywolf Press, 2016). The collection won the 2015 Walt Whitman Award from the Academy of American Poets. We may lose the smaller battle but win the big war. Today's short is the trailer for the forthcoming film Loving (Focus Features). Filmed in Richmond, Virginia, and starring Joel Edgerton and Ruth Negga as Richard and Mildred Loving, the movie relates the true story of the couple's mixed-race marriage, which, illegal at the time, ended in the Lovings' arrests and jailing in 1958 and their nine-year-long lawsuit to overturn Virginia's Racial Integrity Act prohibiting interracial marriage. Handled by American Civil Liberties Union lawyers, the Lovings' case, Loving v. Virginia (388 U.S. 1), ultimately reached the U.S. Supreme Court, which unanimously affirmed the Lovings' right to marry and invalidated all states' anti-miscegenation laws. Directed by Jeff Nichols, the film opens in theatres throughout the United State on November 4. Mildred Loving died in 2008 (read her New York Times obituary); her husband died in 1975. ✦ The "naive" artist Anne Bouie seeks to "explain and communicate timeless spiritual values important for living", according to her Artist's Statement. 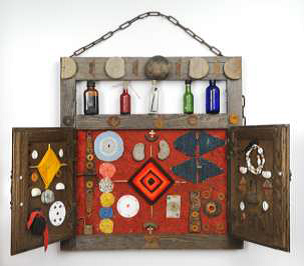 Take time to view Bouie's online Assemblage Gallery and Sculpture Gallery and to read her five-question interview at Eye Level, the Smithsonian American Art Museum's blog. Bouie participated in June in SAAM's Luce Artist Talks series and exhibited The Four Moments of the Sun (see image of part of her installation, below) in her solo show "Anne Bouie: In the Temple of the Ancients", which ran from June 11 to July 9 at Flashpoint Gallery in Washington, D.C.
✦ Japan-born Hiromi Mizugai Moneyhun, who lives in Jacksonville Beach, Florida, uses a Japanese paper-cutting technique called kirie to give her extraordinary works a unique look. Twenty-two of her cut-paper drawings are on view through September 18 at Morikami Museum and Japanese Gardens, Delray Beach, Florida. The exhibition is titled "Shadows of the Floating World". Watch a video on kirie techniques. ✦ The remarkable 17-metre-high structure The Hive, designed by Wolfgang Buttress, is on view at Kew Royal Botanic Gardens until November 2017. Read "How The Hive Experience Is Led by Real Bees" and "The Sculpture Controlled by Bees: Wolfgang Buttress's Hive". ✦ Do you know why the most important art today is made in space? ✦ Architects Jacques Herzog and Pierre de Meuron discuss how Tate Modern was made. ✦ Yesterday's Artist Watch column at Escape Into Life featured textile artist Barbara Schneider, whose work can be seen through September 4 at the Textile Museum's exhibition "Stories of Migration". See additional videos at Hicks's Website. 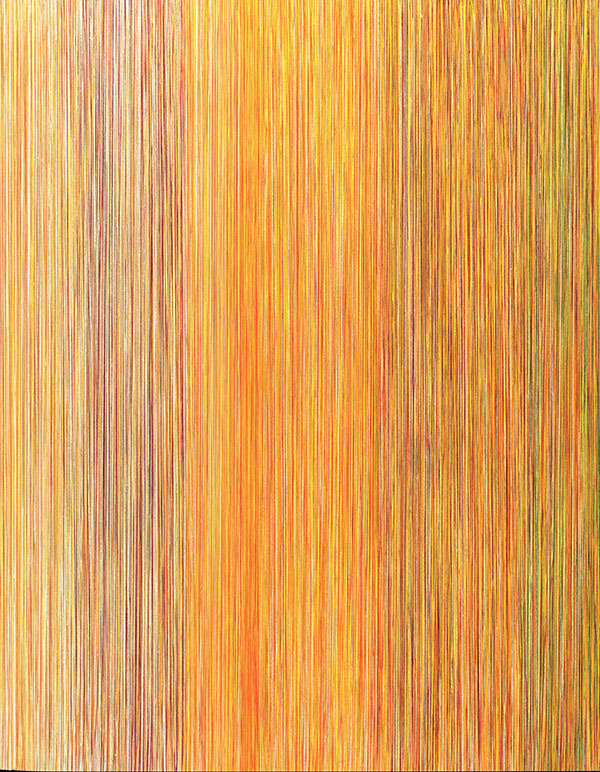 The special exhibition "Sheila Hicks: Material Voices" is on view through September 4 at Joslyn Art Museum, Omaha, Nebraska. A catalogue (image below) accompanies the show. 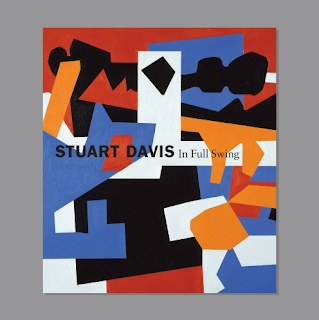 ✭ Continuing through September 25 at New York City's Whitney Museum of American Art is "Stuart Davis: In Full Swing". The exhibition focuses on Davis's mature work and his method of using preexisting motifs as inspiration for new compositions. Some 100 works, dating from early 1920s paintings to work unfinished at his death in 1964, are featured. Audio guides (available online and off) and free daily tours are offered, as well as lectures and other exhibition-related events. A 250-page catalogue (image below) with 143 color illustrations and 41 black-and-white images accompanies the show. ✭ The group exhibition "Outside — In", examining perspectives on and interpretations of the dwelling, both "out" and "in", opens July 29 at the Joan Hisaoka Healing Arts Gallery at the Smith Center, Washington, D.C. The participating visionary artists are Carson Murdach, Michael Nakoneczny, Mars Tokyo, and Lee Wheeler. The show, which runs through September 2, is curated by Spencer Dormitzer and Dolly Vehlow. 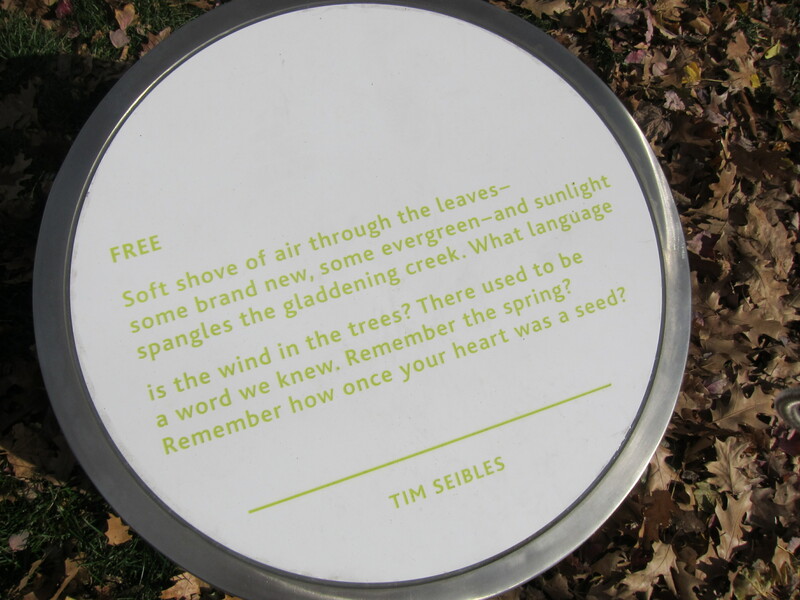 ✭ In Minneapolis, the Minnesota Center for Book Arts has mounted "Collected Voices: 30 Years of Quatrefoil Library". On view through October 16, the exhibition relates the story of the volunteer-run Quatrefoil Library, now the second-largest LBGT lending library in the United States, highlighting both the literature and local publications it offers. ✭ The Crystal Bridges Museum of American Art, Bentonville, Arkansas, continues "American Made: Treasures from the American Folk Art Museum" through September 19. The ticketed exhibition features more than 115 handmade objects, from quilts and carvings, to signs and samplers, to weathervanes and whirligigs. A wide range of workshops and other related events complements the show. New York City's Folk Art Museum is the co-organizer of the exhibition. View a selection of images at the exhibition link above. ✭ Twelve prints drawn from the more than 500 works donated by Rene and Carolyn Balcer to the Virginia Museum of Fine Arts, Richmond, are on view through August 3 in the Works on Paper Focus Gallery. The exhibition, "Snowy Landscapes: Japanese Woodblock Prints by Kawase Hasui", includes the beautiful winter landscapes Snow at the Zojoji Temple (1929) and Snow at Heian Shrine, Kyoto (1948). 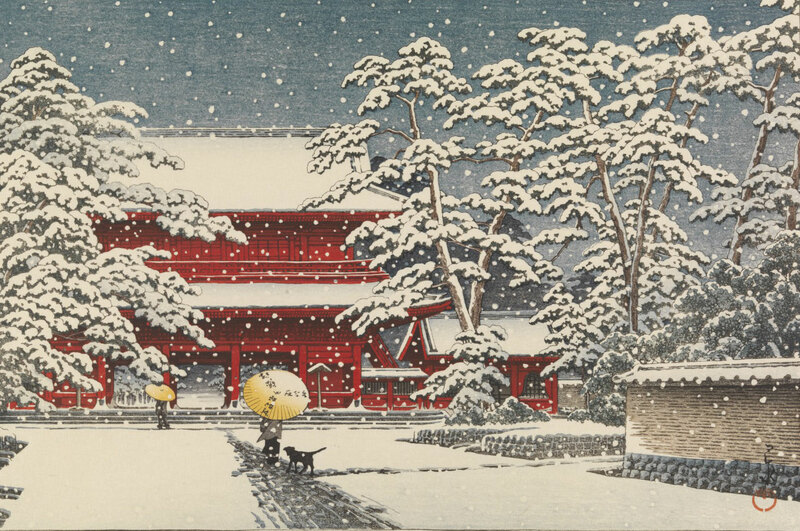 Other exhibition prints from the Balcer collection include Hasui's depictions of Japanese landmarks and rural areas. 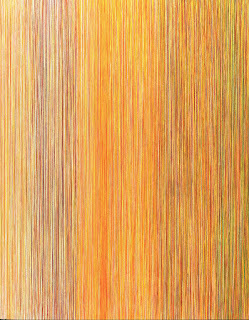 Today, Thursday's Three brings you a trio of published or forthcoming art titles. 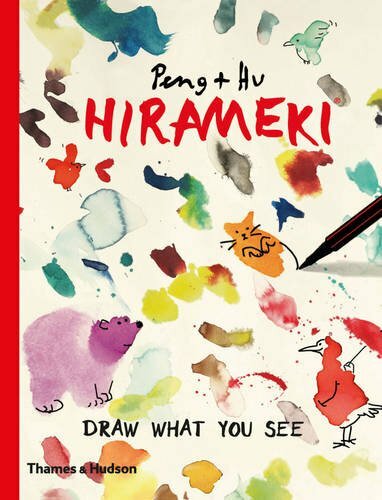 ✦ Hirameki: Draw What You See (Thames & Hudson, March 2016) ~ Peng + Hu's color-illustrated Hirameki — Japanese for "flash of inspiration" or "brainwave" — is for artists looking for a creative spark and doodlers of any age. Their 192-page book, which the publisher describes as "an ingenious take on the Rorschach Inkblot Test", comprises blots and splashes in ink, watercolor, and red wine that users can transform into drawings or blot-to-blot scenes. Prompts and hints are included in the book's seven sections to "guide progress" or to just have fun by letting your imagination take you where it will. Watch this video to get an idea of what's inside. ✦ Fragile Beasts Coloring Book (Cooper Hewitt, July 26, 2016) ~ Published in conjunction with the exhibition "Fragile Beasts", on view through January 16, 2017, at Cooper Hewitt, Smithsonian Design Museum. 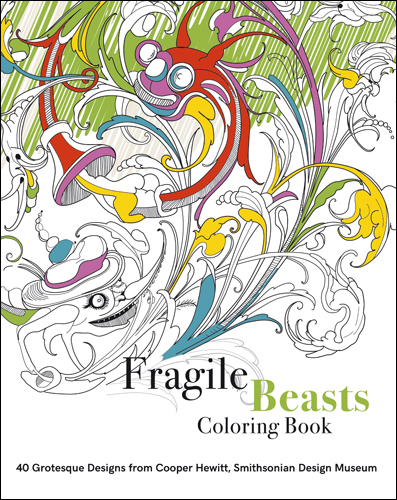 The 96-page coloring book features a selection of grotesques — from serpents and dragons, to chimeras and gargoyles — that have been adapted as line drawings by designer Magali An Berthon from the 16th Century and 17th Century prints and drawings on exhibit. 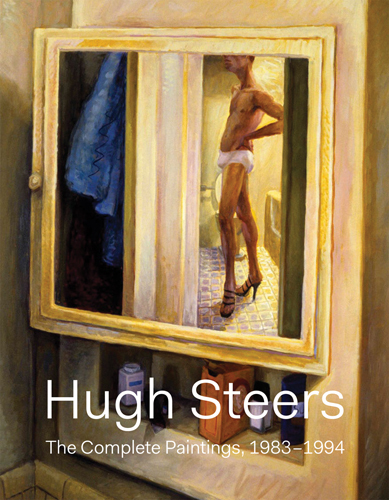 ✦ Hugh Steers: The Complete Paintings (Visual AIDS, February 2016) ~ The first book about the figurative painter Hugh Steers, who died of AIDS, age 32, in 1995, the 248-page volume features more than 600 full-color images of Steers's paintings on canvas and paper. The artist described his work as being in the tradition of "artists whose work embodies a certain gorgeous bleakness." Portland, Oregon's James Allen is an artist who "excavates" vintage books he finds in used bookstores, transforming them into sculptural objects that tell a new story visually. Educated at the University of Wisconsin at Milwaukee, from which he received a bachelor's degree in fine arts, Allen has shown his work in numerous group shows around the country, including "The Book Borrowers: Contemporary Artists Transforming the Book" at Bellevue Arts Museum, Bellevue, Washington. Currently, Allen's Onomatopoeia (2015) can be seen at the San Jose Institute of Contemporary Art in "This Is Not a Book: Chapter 2", continuing through September 11. Allen's work can be found in a number of public art collections, including Johns Hopkins University's Milton S Eisenhower Library, Baltimore, Maryland; Ringling College of Art and Design, Verman Kimbrough Memorial Library, Sarasota, Florida; and the University of Colorado's Special Collections Library, Boulder. In addition, images of Allen's work are in Art Made From Books: Altered, Sculpted, Carved, Transformed (Chronicle Books, 2013). In 2015, Allen was the subject of an Oregon Art Beat profile at Oregon Public Television. In addition to his marvelous and beautiful book excavations, Allen is a painter; see his image transfers. Allen is represented by Laura Russo Gallery, Portland, Oregon (view images of his work there) and Seager/Gray Gallery, Mill Valley, California (view images). Also see images of Allen's unique piece Skulduggery, 75 Years of DC Comics: The Art of Modern Mythmaking, at 23 Sandy Gallery, Portland, Oregon, and read the gallery's feature "New Artist Spotlight - James Allen". Lean into fear. Write the hard poem. In the video below, writer, spoken word poet-performer, and arts educator Elizabeth Acevedo recites her poem "Beloved, Or If You Are Murdered Tomorrow". The timely poem needs no further introduction. Acevedo, a Cave Canem Fellow and winner of the 2016 Women of the World Poetry Slam, is the author of the forthcoming Blessed Fruit & Other Origin Myths (September 2016), a finalist for the Yes Yes Books chapbook poetry prize. Acevedo's work has appeared in numerous literary periodicals, including Acentos Review, Beltway Quarterly, Callaloo, Madcap Review, The Notre Dame Review, Ostrich Review, and Poet Lore. Herrera this year gave the commencement speech at Oregon State University/Corvallis.